The Chalice is a beautiful 17th Century house, full of rustic charm that has original oak beams throughout and is located in the heart of the village of Fenstanton. The Guest House benefits from it’s close ties with the stunning Duchess Freehouse and Restaurant, situated only one door away. Compromising of 5 tastefully refurbished, ensuite bedrooms with complimentary toiletries .The Chalice has free wifi throughout, a delightful dining room where you can enjoy a full English breakfast or something a little lighter if you prefer. The private courtyard at the rear is an enchanting area to enjoy a summer evening. The bedrooms have luxurious beds, mattresses and bedding, hairdryer, Ironing facilities, complimentary tea and coffee making facilities and have been furnished to give a sense of comfort, relaxation and elegance. Because of the age and layout of this beautiful old building, we are unable to accommodate children. Parking is available outside The Chalice or in the carpark of The Duchess on request. Fenstanton has easy links to Cambridge, St Ives, and Peterborough by road or bus and supports a great Fish and Chip shop, Convenience store, Butchers, Baker, Post Office, 3 public houses, hair dressers Nail Bar and a take away shop amongst other retailers. Lancelot (Capability) Brown owned the manor house here 1768-1783 and is his final resting place. The historic market town of St Ives is a gentle 30 minute walk away where you’ll find a range of shops bars and restaurants. Mondays and Fridays boast a market and the recently refurbished Norris Museum nestled by the river is a wealth of discovery. 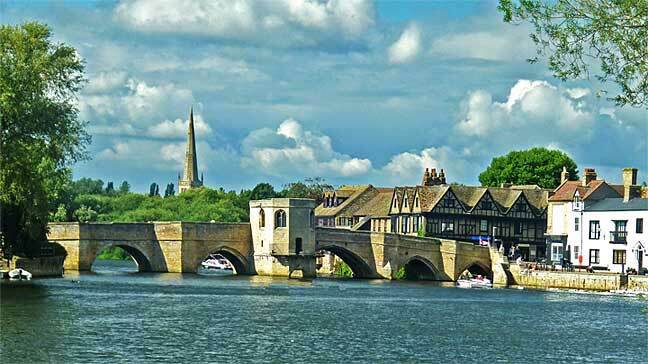 St Ives boasts the famous Oliver Cromwell bridge and has a variety of tracks for Ramblers, runners and cyclist’s, artists and photographers all within the scenic aspect of The River Great Ouse and it’s meadows.